This beautiful little sewing kit will quickly become your favorite for traveling with your sewing supplies. Use those wonderful mini charm packs you've been collecting! Make this quick, easy sewing kit that includes a pin cushion, needle minder, scissor keeper and project case. 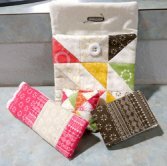 Make it scrappy if you want to use your project leftovers, or use part of a charm pack of larger pre-cut squares. Download the supply list for Janet Clare Sewing Kit. This class is for beginner level quilters with some basic quilting skills, including rotary cutting, piecing using a 1/4" seam and pressing.